The new single, “it’s different for girls,” is an exploration of the “dilemme féminin”. Combining Daft Punk’s aptitude for groove with LCD Soundsystem’s wit—an endlessly quotable track that has Barnes outlining the dangers inherent in binary gendering: “It’s different for girls,from when they are children they’re de-personalized, aggressively objectified…” and later Barnes sings “It’s different for girls, they are mercurial creatures, not a masculine dissonance or sexual currency”. The song is less feminine anthem and more pop exegesis of societal codes. “though some women are demons all of them are God”. Indeed. For the video, Barnes has enlisted a colorful cast of characters and is on a mission to throw the most colorful, glamorous, and boundary-breaking dance party of 2016. The room is adorned with thousands of balloons, bright lights, and signs with adjectives like “hot,” “delirious,” and “smooth,” as each participant takes their turn tearing up the dance floor. The mood is light, playful, and most importantly, welcoming to all shapes, colors, and orientations. As Barnes performs for the camera several coy smirks cross his face as he can hardly contain his enjoyment of the events unfolding behind him. This video feels like it is going to carry a lot of weight in the of Montreal catalog, which speaks volumes considering how rich of a visual history already exists for the band. Please feel free to get in touch with Andy Gesner and the HIP Video Promo team to let us know if you’d like to check out a copy of Innocence Reaches or to catch them on their fall US tour. Our friends at Polyvinyl Records are always there to hook us up with whatever we may need! For more information call (732)-613-1779, email at info@HIPVideoPromo.com. 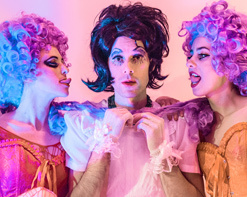 You can also visit www.PolyvinylRecords.com for more info on of Montreal.